Minnesota gardeners grow a variety of perennial flowers in a state where the first average frost date occurs sometime in September or early October. Fortunately for Gopher State gardeners, the hardy peony is a spring bloomer. According to the Minnesota Peony Society, peony blooms peak in the fourth through sixth week after the last frost date. In Minnesota, that’s during the middle of June. With a growing season of 150 or fewer days, Minnesotans must start peony fall care tasks earlier than their neighbors to the south. 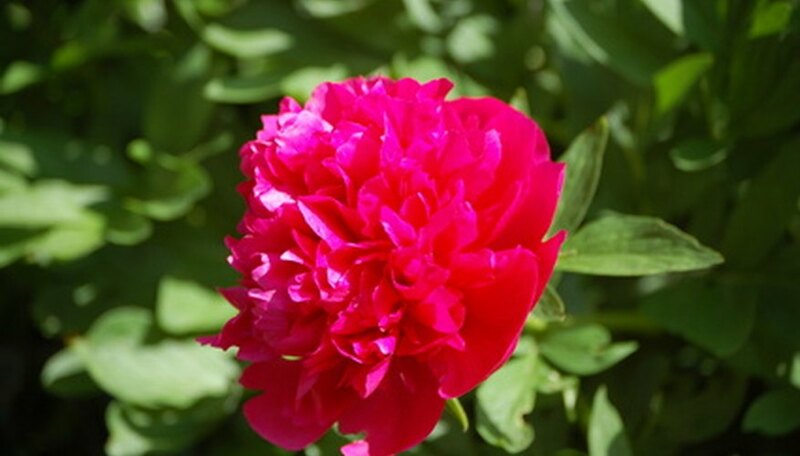 Stop fertilizing peonies in late July or August. Yes, it seems early but keep in mind that the end of the growing season ranges from mid-September to mid-October. Cut back on fertilizer to withhold nitrogen that encourages top growth; the roots will keep growing. Plant or transplant peonies in late August to mid-September depending on where you live in the state. Peonies should be planted or moved by early September in the north so they have a few weeks to grow roots before the ground starts to freeze. Set Minnesota peony tubers a bit deep; eyes should sit about 2 inches below the surface to guarantee survival. The plant will position itself properly when it blooms next spring. Clean up peony foliage in mid to late October after a few freezes to give Minnesota peonies as much sun exposure as possible. Cut peony stalks down below the surface of the ground with a sharp knife or pair of shears when the brown stalks begin to curl or the ground has begun to freeze. Rake all foliage and summer mulch and add it to the compost heap. Apply up to 2 inches of compost mixed with humus or peat moss as a winter mulch. These materials will insulate roots until the first snows and provide some slow-release nitrogen for the plant to use next spring. They will also help the texture of sandy Minnesota soils. Avoid bone meal and wood ashes; large areas of the Northern Plains have alkaline soil. Water peonies until the soil begins to freeze. Cold northern winters dehydrate soil and desiccate plants. Most peonies are hardy in USDA zones 3 to 8, and many will do well up to zone 2. Only the tree peony, which grows from zone 4 south, will not thrive in all corners of Minnesota. Although many perennials should be left in the garden to hold snow and insulate the roots from winter winds, peony stalks often carry a fungus blight that is able to survive the winter so they should be carefully cut down almost to the tuber. Fall is a good time to amend soil or add lime or nutrients. The University of Minnesota Soil Testing Laboratory in St. Paul performs soil test for homeowners. They can diagnose your soil's specific needs. Don't add diseased foliage to a compost heap. Burn it or dispose of it through a municipal waste program.